The above being said, there are some things that you should know BEFORE you buy any of Now TV’s Sky Sports passes. This is because the passes don’t offer exactly what you would get from a regular Sky Sports subscription. In fact, there are some very key differences. Knowing these differences will help you to decide whether a Now TV sports pass is the best option for you. 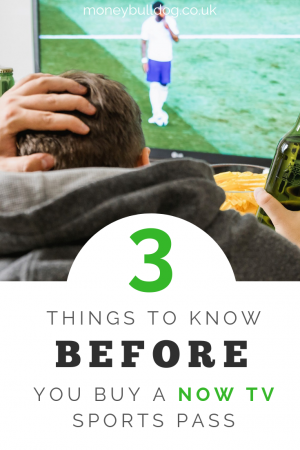 Here are 5 Major things you should know before you buy a Now TV Sports Pass*. The first important thing to know is that, at present, there is no red button content available with Now TV. This means that some games or content that would be available on a standard Sky TV sports package will not be available with Now TV. One way we could illustrate how this might affect you is with Sky’s coverage of football from The Championship. With a standard Sky Sports package right now, you can watch pretty much any championship game on certain match days, as they are available on the same channel but via the Red Button. With Now TV, this isn’t possible and the games you are able to watch will be limited. This has the potential to cause a lot of frustration if you order a pass with the intention of watching your favourite team, only to find the game isn’t available as advertised. Another thing to know is that you can’t pause or rewind live TV on most devices. You can only currently do this if you have a Now TV Box or Stick*. You can pause and rewind on demand content on other devices, however. It’s also worth noting that you can’t record live sports channels. So, if you love watching great goals again and again, then you’ll need to have the right Now TV equipment. Our final point of note is that the Now TV Mobile Pass* doesn’t carry all of the channels of a standard Sky Sports package. As discussed in our last post, the Now TV Mobile Month Pass only gives access to 4 channels. These are Sky Sports Premier League, Action, Arena and News. Who might this cause a problem for? Well, if you are hoping to watch the golf on a Mobile Month Pass, then you will be disappointed. This is because it doesn’t feature on any of these channels. The Golf lives on the Sky Sports Golf Channel, which has changed names to the Ryder Cup Channel for this weekend’s upcoming event. The same is true of football from The Championship, SPFL or MLS. These leagues are hosted on the Sky Sports Football Channel and not Sky Sports Premier League. So, while the Mobile Month Pass offers great value if you’re only wanting to watch certain sports or leagues, it’s not so great for others. The reason we’ve written this post is simply to help you avoid disappointment or hassle. Now TV Sports Passes* offer great value but you really do need to know what it is you are buying. If you don’t, then you could find yourself disappointed. You could also find that you have the hassle of trying to get a refund for a pass that didn’t do what you wanted it too. Or more to the point, didn’t let you watch the games or events you wanted. Still, we are not having a go at Now TV. We like their passes. We’re just trying to give our readers a heads up to save them the potential disappointment or headaches.